I picked up this book a few years ago at the Twin Cities Antiquarian Book Fair and every word of this book is completely delightful. I can't believe this slim and gorgeous book is 87 years old. It even includes an immaculate sample daily report sheet. 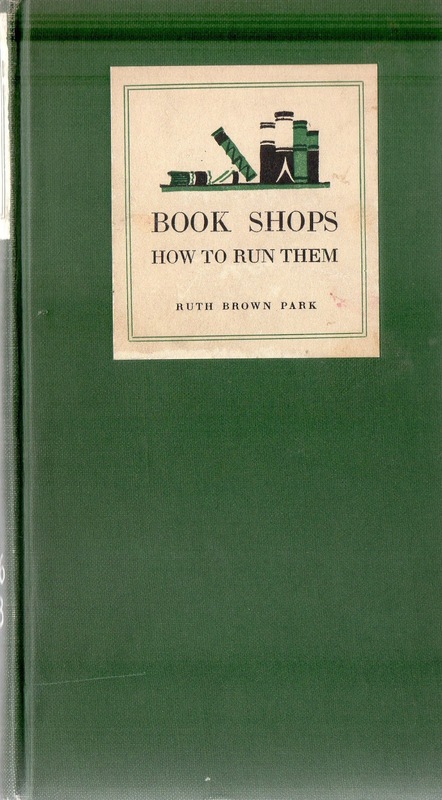 So here, excerpted for your enjoyment, are a few of my favorite bits from Book Shops: How to Run Them by Ruth Brown Park. "So it is to be a book shop? You have talked it all over with yourself; with your friends; with your pet dog, and perhaps with your family. You have decided books are your medium for making money. You feel that coal or popcorn or antiques would not be your medium, but that books would. For books, underneath their square surface value, carry realms of further interior interest. You may not only pick them up and hold their solid circumference in your hands, but you may open them, peer into their unfolding pages, and bury yourself in the delights of those pages. Then, when you have surfeited yourself with those delights, you may pass them on to your patrons, for money. We know of no other business where a merchant may both have his cake and eat it at the same time. Therein lies the advantage." Another point: Avoid giving a prominent place to books of a sensational or libelous nature. If you must carry them, at least do not boast flagrantly about it through prominent display. Instead, give the prominent display to popular books of the moment without these undesirable qualities." "Down the street they come – those potential book customers. They are in a hurry. They are rushing along to important engagements. They are flying for trains. They are dashing for home before dark. They are intent upon their own business and utterly unconcerned about yours. Now what are you going to do to break that intent and make them concerned about yours. You cannot stand outside your shop with a raised club and demand, “Go in there.” At least, you cannot and still remain a public favorite. Nor can you even stand in the doorway and quietly beckon. Not unless you wish to be misunderstood. No, you can neither club nor call. You must legitimately attract. And your only legitimate attraction at first is through your windows." When the customer has practically finished his purchasing, suggest a must have book. 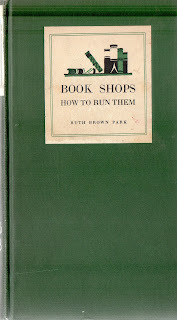 Such an item should be small and popular priced, although any additional books sold to such a customer is a plus sale. Usually, the customer will say, “Oh, add it!” The plus item should be a popular book – one that is in great demand, so that the sale does not seem to be forced, but natural. Use the power of suggestion to the utmost. Keep suggesting different titles until the customer is through buying; don’t let him rush off with one book. Keep the customer in the shop as long as possible. People who say, “I’ll come back when I have more time,” don’t mean it at all; that is merely an excuse for getting out without buying. Don’t let customers wait until next time, sell them this time. Make for yourself new customer contacts. Nothing pleases a customer more than personal attention. Get on as intimate a plane as possible with your customer, without offence. Don’t waste time on non-buyers. One of every book shop’s greatest pests is the kindly chap who comes in to “talk books.” These people can be a serious menace to business if you let them. They seldom buy, but, oh, how they can talk! Yet they have to be tolerated because they sometimes weaken and buy a book. But steer clear of them as a rule, when they are in a talking mood. They’ll soon tell you if they want to buy anything. By this I don’t mean to cut short the person who has just finished buying and wants to “talk a little.” This practice is bad, and one that you must guard against. Still, with other customers waiting for you, you can’t afford to talk very long. Be tactful in this matter, and try to please both customers. Remember, many added sales can be made by avoiding as far as possible the 'talker.'" "How are you going to get word to those who have passed by, or to those who have never even passed your way, that you have an attractive shop, overflowing with tempting buys, waiting to serve them? How are you going to speak for yourself, against and above the tremendous roar of other competitive forces in your business? Of course, you could go out twenty or thirty feet beyond your shop and shout the news to the oncoming crowd – you could, until the police force in your city heard you and locked you up. Or you could mutter the news in trains and on boats, or pass the word along in railway stations and subways – you could, but you would not be considered a rational human being." "Now, be it known, first, last, and always, the successful manager or owner of a book shop is no ordinary mortal. For he must have the book knowledge of a head librarian; the book love of a bibliomaniac; the business sense of a Wall Street magnate, and the patience of an orphans’ home matron. Added to these things, he must instruct his clerks with the trained vigilance of a Harvard professor and lead them to selling victories with Foch generalissimo proclivities. In a small shop often publishers’ salesmen give customers a very bad impression. They stand around smoking and talking while waiting their turn with the buyer. As they are usually hatless, they are indistinguishable from the regular clerks. Naturally, they do not offer to wait on trade, and many customers are offended, thinking they are being neglected by the store’s regular staff. So by all means put a stop to this “village store” atmosphere and tactfully urge travelers to wait quietly in a hatted condition. So by all means put a stop to this “village store” atmosphere and tactfully urge travelers to wait quietly in a hatted condition." "In no other department, should greater conscientiousness be exerted by the bookseller than in this one. When you are buying for adults you may have a certain educational and moral twist to your conscience, but in most instances it is feeble. If a full-grown man wants a badly written, blood-and-thunder story, that is his own look-out. Or if a blonde approaching middle age slinks in to mumble a request for the newest, highly heated love drama, that, too, is none of your concern. But, on the other hand, if a nice rosy-cheeked little boy darts in and asks for the best story of adventure you have to offer, you want to know the best story and have it to give him. If you do not, and through carelessness, hand out some cheap, poorly executed piece of work, unless you are the kind of person who would take candy from a baby, you cannot be very easy or untroubled in your mind. Right here a word should be said about forcing too dry reading on a child. There are so many good enthralling tales which will not choke the little reader that it is unforgivable to hand him something unpalatable. Often too advanced reading will kill forever a real love of literature in the child. What greater sacrilege could be committed than smothering a taste for reading in a small, unformed soul! If you are too busy to give much time to this department we would suggest that you choose an attractive young woman with some knowledge of children’s education as the head of that department. If she has any kind of initiative she can do a big thing for you, for your store, and for herself." "Why is it that the average bookseller thinks he can start on his professional road without the slightest knowledge of his trade? Why does he think that he can plunge into a business requiring unlimited technique without the faintest notion of advantage of his public, strutting about his shop, pluming himself with the fruits of his bestseller knowledge, in utter ignorance of the things which would make him invaluable to the intelligent bookreading public? Up to date this question lies unanswered. But gradually, as the general impetus demands it, book people are going to become more and more accustomed to give skilled book information and less and less prone to hand out ungrounded answers. Then the halcyon days of bookselling will have set in. The book concludes with the 1927 American Booksellers Association Code of Ethics and is well worth reading, even if it states that '"the head of the business should be a man of high character and sound integrity.'" Are you sold? I am! Let's go sell some books!